Nettles aren't just an annoying stinging weed. They also have amazing blood-cleansing properties. And springtime is the best time to collect them from the outdoors, while they are young and especially potent. Is it best to use nettles dried into a tea, or to juice it raw? Actually both ways work well. With a dehydrator you can dry nettles so that you can have nettle tea all winter long. But fresh nettles are the most potent, both in taste and effectiveness. Raw foodists view fresh nettle juice as a treatment for many ailments, especially those regarding allergies and inflammation. It is possible to drink pure nettle juice, but because of its strong taste and potent effects it is best consumed as an ingredient in other juices or in small 30 ml shots. Don't worry about drinking something which can sting, as a slow juicer will crush the stingers and leave only the juice. But be careful when feeding the leaves and stems into the juicer - it is best to use gloves or tongs for this. Nettle juice should be consumed only for a short period of time - 7-10 days as it is very concentrated and powerful. 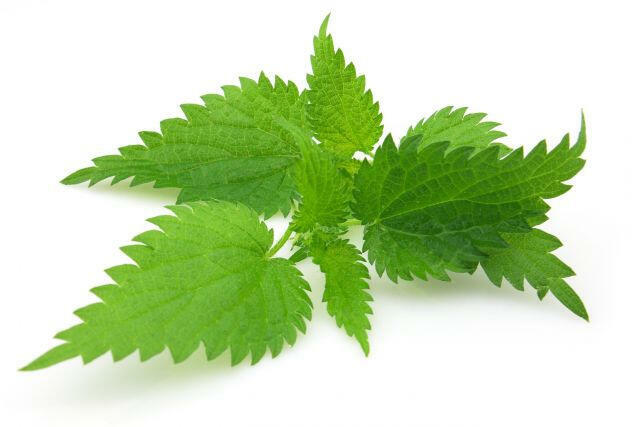 Because it can alter the menstrual cycle, nettle should not be consumed in any form during pregnancy. Wash and cut all ingredients. Feed them alternately into the juicer. If the lime is organic, you can juice the peel as well for an added kick. If you'd like to experiment even more, nettles go well with pears, pineapples, lemons, or kiwi. You can also add it to the classic apple-carrot-ginger combination for an extra punch of nutrition. Like all greens, nettles aren't suitable for a centrifugal juicer. Any slow auger juicer will do a good job processing them. For the best results, a dual auger juicer like the Omega Twin Gear or the famous Angel juicer will extract the maximum amount of juice.